I believe that there is no single answer to this question. Rather, there are multiple factors that play a role in making your indoor wattage lower than your outdoor wattage. Let’s examine these factors so that you can better understand some of the issues behind this phenomenon and also what you can do about it. The rear wheel resistance type trainer is the most common and has been around the longest and has different ways of creating resistance on the rear wheel, such as: fluid resistance, magnetic resistance, and electric resistance. Some of these also contain a weighted flywheel with the intent to help create an additional feeling of inertia similar to what you might feel on the road. 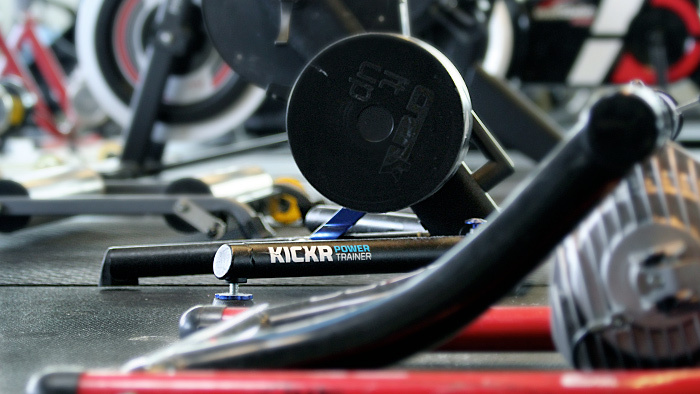 All of these trainers create resistance throughout the entire 360 degree pedal stroke. This is one of the fundamental differences between riding indoors and outdoors. As you ride outside on the road, your bike continues to move forward with momentum from the force that you exerted onto the pedals from roughly the 1 o’clock to 5 o’clock position in the pedal stroke. Across the bottom and top of the pedal stroke, the legs have little ability to create any meaningful force against the pedals because of biomechanical inefficiencies in body position due to being seated almost directly above the crank. This lack of resistance to pedal against may even give the legs a micro-rest in each pedal stroke as the momentum of the rear wheel continues moving forward and the legs try to keep up with the rpm’s needed to move the crank. To be clear, it isn’t just the momentum (stored kinetic energy) of the rear wheel that keeps us moving out on the road, but rather that of our body plus the bicycle as a whole. An easy way of envisioning this is to imagine trying to stop the rear wheel of your bike wheel when it’s spinning rapidly in the workstand by grabbing the tire with your hand versus trying to stop that wheel while spinning out on the road using the same technique. In general, until you are “trained” to ride on a rear wheel resistance trainer, your watts will be 20 to 30 watts lower on the trainer than outside. As you become trained to this way of pedaling, this gap will narrow and quite likely go away. The direct drive trainers were invented to overcome this issue and by taking the rear wheel out of the equation. By adding in a heavier flywheel, a simulated rear wheel momentum type action is created. When you stop pedaling on a direct drive trainer the rear flywheel continues to roll until it’s inertia is exhausted. The direct drive trainers have been largely successful in creating a more realistic road feel. As a result of the lack of resistance across the bottom and top of the pedal stroke, you are able to produce very similar, if not identical wattages indoors as outdoors. One new direct drive trainer has really taken it to the next level. Using super fast microchips, the Tacx Neo trainer figures out how to reduce force across the bottom and top of the pedal stroke thereby making the feel of the ride and effort level nearly identical to riding outside. Rollers are arguably not even in the indoor trainer category, but I included them as many people use them and they are great indoor training tools. Some of these have resistance units attached to them and some do not, which means that those without resistance units virtually have no resistance. On these, riding in your 53×12 gear is a piece of cake. While certainly more similar to riding outside than an rear wheel resistance trainer, the lack of resistance makes it challenging to do hard intervals. With a resistance unit, rollers become a much more useful indoor training tool with regards to improving fitness while maintaining the road feel. Depending upon the resistance method, the rider will be able to produce similar wattages as outdoors. Dedicated indoor spinning type bicycles come in many different sizes and shapes. Most have a heavy rear flywheel to help create that momentum to keep the pedals turning over. Since they also are without a clutch (freewheel), they feel similar to riding a fixed gear bicycle. This allows the user to spin their legs freely and continuously without resistance if none is applied. However, most indoor cycling bikes apply resistance to the rear wheel in some manner and apply it across the entire 360 degree circle. Thus, this comes back to the same issue of a rear wheel resistance trainer. This is somewhat mitigated though by a larger flywheel creating more momentum and cancelling out a lot of that resistance across the bottom and top of the pedal stroke. In general, riders can produce similar wattages to when they are riding outdoors. I haven’t mentioned calibration of the indoor trainer power meters versus your on-the-bike power meter, but it’s important. If you do not do the calibration procedure carefully each time you ride your indoor trainer, then the wattages can be wildly different between the two power meters. It’s critical that you know how to calibrate your trainer in order to have the most accurate power readings. If you are using a rear wheel resistance trainer, I recommend that you use a special indoor trainer tire designed for this purpose, along with always running the same tire pressure each session. Lastly, I recommend that you always download and use your power from your on-the-bike power meter as you know that to be accurate and consistent. There are three main variables to consider when comparing your indoor wattage to your outdoor wattage. Each one by itself may be minor, but added together they can make a large difference. Being fixed into one position without the ability to move the bicycle causes you to use more isolated muscles that might not be used to working quite so hard. When your bike is locked into a trainer, your body stays more in a more fixed position as well. When riding outdoors, we are constantly shifting our body on the bicycle which allows us to recruit some of our upper body to help the core and legs to produce power. This also gives some muscles a rest, helping them to recover and produce more power. Losing the ability to effectively wobble the bike back and forth dramatically reduces our ability to produce peak wattages in short periods of time. I recommend to my athletes to ignore any sprinting wattages as they just aren’t representative of what can be done outdoors. When riding at a steady state effort, like at tempo, Sweet Spot or Functional Threshold Power (FTP), many riders will complain that their inner adductors (inside of thighs) will really hurt during their first 2 to 3 weeks of indoor riding. These muscles just are not trained and under utilized when riding outdoors. This can cause more strain on these muscles along with others which in turn can reduce the amount of watts you are able to produce. Being locked into one position does take some getting used to and as you become more trained at riding the indoor trainer, this will become less and less of a factor. Temperature plays a significant role in the ability to produce wattage when indoors. Staying cool is very important while riding indoors, a small change in body temperature can create a large change in the amount of power you can produce. As your body becomes hotter and hotter, you will perspire more and more to help cool the skin. Losing that fluid creates thicker blood and therefore more resistance internally in the cardiovascular system. The result of this is that your heart has to pump faster in order to get the same amount of blood to your working muscles. This is called cardiovascular drift and while you are stressing the heart more, you are not increasing your absolute FTP. By keeping yourself cool and hydrated, you will be able to produce more wattage for a given heart rate and thus increase your overall absolute fitness. Overheating can easily cause a reduction in indoor power by 20 to 30 watts alone, so it’s critical that you have a large fan blowing on you during your workout and if you can do it in a cool room, that will make a difference as well. Psychological factors are always in play when it comes to performing your best. Never discount the power of the mind in your ability to produce wattage. If you are riding indoors in your dark basement near the cat litter box, then let me tell you, it’s just not as motivating as riding outside on a clear, sunny day! Indoors is just not the same and it never will be. There are multiple ways to distract yourself while riding indoors and I have found these particularly effective in keeping motivated. Using a program like Zwift, TrainerRoad, ErgVideo, RealTrainer, or just watching some old cycling races can really be helpful in keeping the mind focused on riding and not the fact that you are stuck indoors for the next two months. When you are not as motivated, this can contribute to a reduction in wattage. By having clear goals for the spring that motivate you, along with something entertaining to watch, it makes it much easier to produce wattages similar to outdoor riding. Another thing that will help you indoors is having a specific workout or training plan to go by. I have multiple indoor training plans available on www.TrainingPeaks.com/hunter that give each workout a purpose and help you to stay on track this winter. When you add all of these factors up, you can see that clearly these factors can compound on themselves and cause a pretty significant reduction in wattage versus outdoors. This brings us to the next question which is: Should you adjust your FTP for indoor training? If your indoor wattage is 10 watts or greater different than your outdoor wattagethen the answer is yes. If your indoor wattage is over 10 watts different than when you ride outside, you are going to have to do an indoor FTP test within a week of starting to ride on the trainer. I know you don’t want to do it, but it is critical to ensuring that you are training in the correct power training level when you are indoors. For example, if your outdoor FTP is 250 watts and your indoor is 230 watts, but you use your outdoor FTP when inside, then you are going to be training much too intensely this winter. This would likely result in you failing to hit your intervals at the prescribed wattage. Not only is this a real bummer, but it could cause you to mess up your whole periodization plan for the year and either peak too early and/or lose form too early as well. When you start riding indoors and you know you’ll be indoors for the duration of the winter, you really should test indoors and use that FTP for at least six weeks. After six weeks, you should then re-test to see if your fitness has improved and/or you have become more adapted to riding indoors. When you start riding outside as warmer weather beckons, you need to do a new outdoor test in order to make sure your FTP is correct for riding outdoors. Your wattage indoors can be dramatically different than outdoors and it’s most likely for a variety of reasons. With that being said, if you train exclusively indoors, keep yourself cool and are highly motivated, then you will be trained on your indoor trainer and your wattage indoors and outside will be very similar. Not everyone will have a difference between their indoor and outdoor wattage. I once coached an athlete who lived in the Artic Circle and trained inside eight months out of the year. His watts were identical indoors versus outdoors. The critical things that you need to take into account to make sure you are training correctly this winter indoors are are to test your FTP indoors to set your correct zones, and to stay cool. If you focus and push yourself this winter indoors, you can have some of the best workouts of the year and use them as a catapult to launch yourself to the next level in 2016. Want to learn more about Functional Threshold Power and other important TrainingPeaks metrics? Check out our online course for everything you need to know to take your training to the next level.